Description: Home to be built - photos are of previously built home. 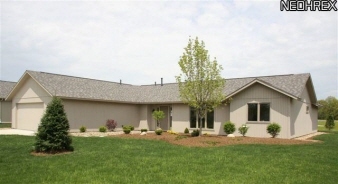 This home features a large grand room, spacious kitchen with dining area, island and large pantry, three bedrooms - master with full bath and walk-in dressing room, utility/mud room, insulated garage with pull-down stairs to overhead storage, hot and cold water, floor drain, door operator, and steel insulated door, fully landscaped yard including a 16' x 12' concrete patio. Design and build your dream home in approximately four months. Numerous single family and cluster home sites available. Subdivision state-of-the art clubhouse, fitness center and olympic-sized pool.